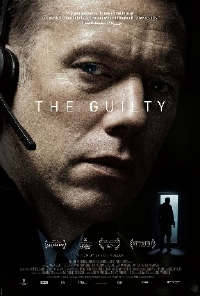 One of the buzziest titles of the festival circuit so far this year is Danish director Gustav Moller's thriller The Guilty. The movie stars Jakob Cedergren as Asger Holm, a police officer recently demoted to desk work. He's biding his time answering the rather banal emergency line when he receives a call from a panicked woman who abruptly disconnects. Asger calls back, a man answers and so begins a chase to find the kidnapped woman; except Asger is relegated to the police station and must use his skills, and officers in the field, to help him find the woman. The first thing that came to mind after seeing the trailer to The Guilty was Locke, the excellent Steven Knight thriller with Tom Hardy which plays out completely in a car as Hardy's character talks on the phone. Writer/director Moller gives himself a little more space here but the conceit is very similar: we only see the action from one side of the story and then that action is only heard. It's an interesting concept and from most accounts, Moller seems to have successfully pulled it off. We will soon find out. The Guilty opens October 19.